Pressure Sensitive Adhesives Market size was estimated over USD 6 billion in 2017 and the industry will grow by a CAGR of close to 5% up to 2024. The pressure sensitive adhesives market will be driven by escalating demand from the packaging industry. The product offers various benefits such as instant bonding, versatility and being user friendly, which increases its demand in the packaging and logistics. PSA bonds to a variety of substrates and coatings and the manufacturers are keeping pace with the changing packaging innovations. The global packaging industry reached more than USD 770 billion in 2012, having increased by USD 65 billion since 2008. It is growing at an annual rate of 4% and reached more than USD 900 billion in 2018. These developments would further increase the product demand in the market during the forecast timeframe. PSAs have been increasingly used in vehicles as alternative to bolts, rivets and other fasteners. This is done to improve the speed and ease of assembly of the vehicle by liquid adhesive use. Other benefits offered by the product are use of thinner & lighter materials, reduced assembly time, negligible requirement for surface refinishing, cost reduction, etc. The product has a wide variety of end-users as it can bond dissimilar materials without incompatibility concerns. Increasing prices of raw materials like acrylate, silicone, rubber and other chemicals could hamper the pressure sensitive adhesives market growth in the forecast period. Certain raw materials are petroleum derived products; hence they are also subject to price fluctuations. Based on technology, the market has been segmented into solvent based, UV cured, water based, and hot-melt. Water based technology is the largest product segment in the pressure sensitive adhesives market which will gain with a CAGR of more than 5% in terms of revenue during the forecast timeframe. Water based adhesives are suitable for various applications including graphics, labels, tapes etc. Some of its benefits are good adhesion on various substrates, excellent die-cuttability, superior water resistance and suitability for speed coating. Solvent based technology is majorly used for optical applications. The unique characteristics of this technology are excellent adhesion, good cohesion at high temperature, good bonding to curved surface, excellent plasticizer resistance, high viscosity etc. They consist of tackifiers, solvents, polymers, etc. which are dissolved together. The raw materials of solvent based PSA are petroleum derived products and are costly as compare to other categories. The solvent based technology is most likely to grow at a CAGR of more than 3% in terms of volume during the forecast timeframe. Based on product, the pressure sensitive adhesives market has been segmented into rubber based, acrylic, silicone and others. Acrylic is the largest product segment which is projected to grow at a CAGR of more than 4.5% in terms of revenue during the forecast timeframe. Acrylic PSA are more oxygen and heat resistant. They can be manufactured with various adhesion properties ranging from less-adhesion & low tack capability to very high tack capability and bond lastingly to any substrate. Acrylic adhesive tapes have a wide temperature range where it can resist up to 300°F. Rubber-based is another significant product segment in the market which is likely to grow at a CAGR of around 5.5% during the forecast timeframe. 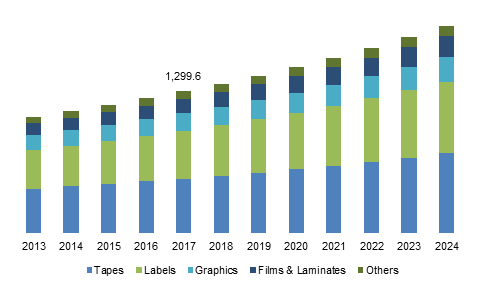 Based on application, the pressure sensitive adhesives market has been segmented into tapes, labels, graphics, films & laminates and others. Large variety of PSA tapes are available in the industry which includes single coated tapes, double coated tapes, reinforced tapes, specialty tapes, masking tapes, packaging tapes, consumer tapes, etc. This application segment is anticipated to grow with a CAGR of approximately 5% in terms of revenue during the forecast timeframe. Labels is another significant application segment in the market. Labels have an extensive application in many end-user areas such as electronics, medical, food & beverages, packaging, consumer goods etc. It is likely to grow with a highest CAGR during the forecast timeframe. Based on end-user, the market has been segmented into food & beverages, packaging, electronics & laminates, medical & healthcare, building & construction, automotive & transportation and others. Packaging is the largest end-user segment which will grow by more than 5% during the forecast timeframe. It helps in fast bonding of various materials and improving the product appearance. Electronics and laminates are another important segment in the market which is likely to grow at a CAGR of more than 5% during the forecast timeframe. 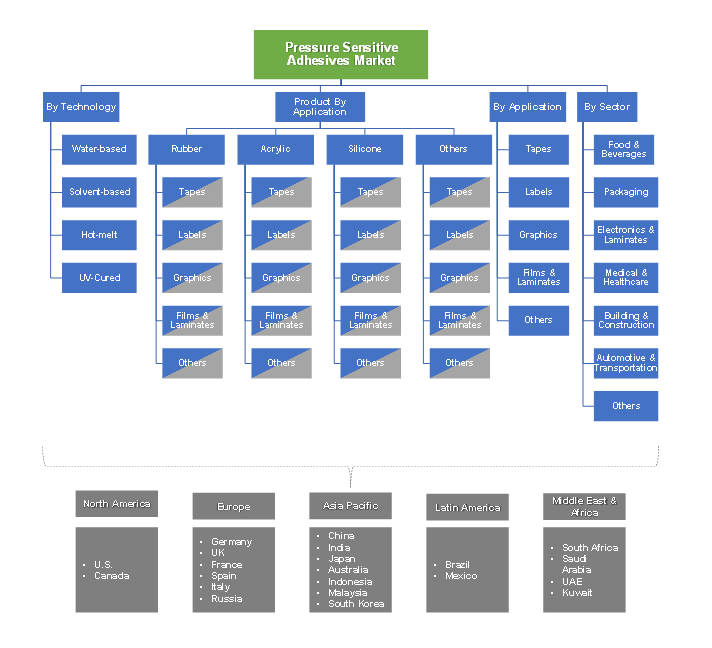 Asia Pacific is the largest pressure sensitive adhesives market in the world. One of the major reasons driving this industry is that the region accounts for more than 40 percent of the global packaging industry. In emerging countries, such as China, India or South Korea, the affluent middle class is growing, and consumption is growing along with wealth. The market in this region recorded a revenue around USD 2.5 billion in 2017. Europe is another significant market which will gain by a CAGR of approximately 4% during the forecast timeframe. Rising demand from countries like Germany, UK, Spain, France etc. would drive the market in the region. Pressure sensitive adhesives market is characterized by the presence of many global and regional companies. The major players in the market includes Dow Dupont Inc., BASF SE, Henkel, 3M, Arkema, Sika, Momentive, Avery Dennison, Ashland and many more. The pressure sensitive adhesives industry is most likely to witness escalating growth due to developments in the global packaging sector. Rising demand from developing countries such as China and India would increase the product demand. Environmental concerns have also led companies into investing in research and development activities to promote product development.